INTRO This week, the treasury yields between a 5-year note and 3-year note inverted. Meaning interest payments to purchase 3-year notes began to pay higher interest than that of a 5-year note. The relationships between the two differently termed bonds are usually the opposite. This inversion does not equate to a recession, but it does sound an alarm. YIELD CURVES In December 3rd Yahoo! 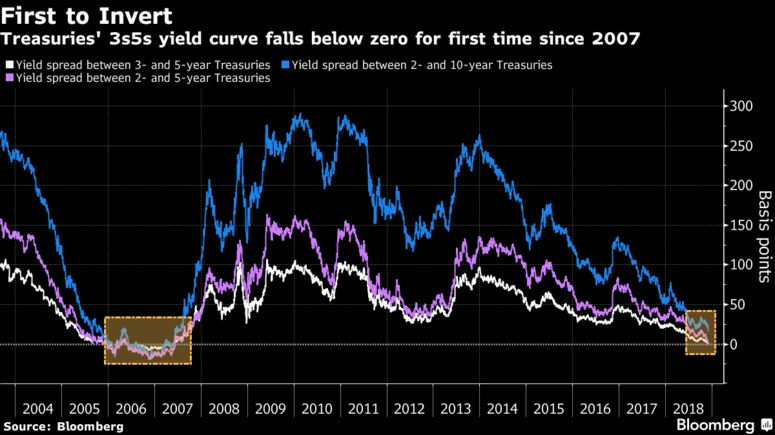 Finance article, analysts pointed out that the yield curve inversion is not the cause of recessions historically, but an indication of the near-term risk for an economic slowdown to begin. Yahoo! What we don’t want to see is for a yield curve inversion between 2-year and 10-year notes. Every US recession over the past 65 years followed this scenario. Bond yield rates correlate to an amount of risk. Investors get paid higher yields for taking on more risk. The less risky debt investments are (of any kind), the lower borrowers need to pay. Central Bankers are growing more concerned about the growing risk for recession. Even Fed Chairman Jerome Powell seems more muted on future rate increases as of late. Not all analysts see a cause for concern. John Iborg of QS Investors LLC said that the 3-year/5-year inversion doesn’t mean much that rates will jump across all short-term US debt. Many other bond rate factors are being monitored before we will know where the economy is indeed heading. Bloomberg, The Fed Reserve board meets again in January. Hopefully, what we will see at most in 2019 is the discontinuation of Fed rate increases. MARKET RESPONSE Markets are showing positive gains response to signs that the US and China can agree on tariffs. This week Presidents Xi Jinping and Trump decided not to implement any more duties beyond what is already scheduled. This sends a signal that the ratcheting of trade disputes is costing them back at home. Well, they’re right.